Catch The Big Wave on Big Kahuna! 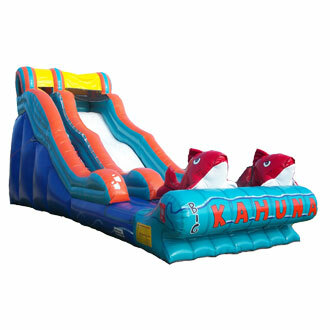 Description: Available wet or dry the Big Kahuna is one of the most sought after slides in the industry. It colorful details and its size make it hard to miss. If you are looking for a water slide rental this is the one to get. We serve Paramus, Clifton, Paterson, Haledon, Wayne, Fair Lawn, and many more towns in new jersey.nThis beautiful inflatable slide can be used as a regular dry slide or as a water slide. call today more more deals and to book this awesome slide for your next event. 36ft Long x 14ft wide x 19ft high. Requires a set up area of 45ft long x 18ft wide.